Spain Plans To Remove Franco's Remains From A Memorial, Angering His Supporters More than four decades after his death, the dictator Francisco Franco remains a divisive figure. His tomb is situated at a memorial outside Madrid that has become a pilgrimage site of sorts. The Valley of the Fallen, outside Madrid, includes Gen. Francisco Franco's tomb. Dozens of people are holding a Roman Catholic Mass in the underground basilica of Spain's Valle de los Caídos, the Valley of the Fallen. The vast complex outside Madrid includes a monument and a church that leads to the tomb of Spain's 20th century dictator, Gen. Francisco Franco. The cavelike place is dark and full of fascist-era architecture: rigid lines and imposing statues. On a recent Saturday, Franco's tomb is covered in flowers with red-and-yellow ribbons depicting the Spanish flag. Several people kneel and kiss the tomb. The site is controversial, seen by many as a monument to fascism. Franco's 36-year reign — which lasted until his death in 1975 — was notorious for the imprisonment, torture and killings of those who spoke out against his regime. 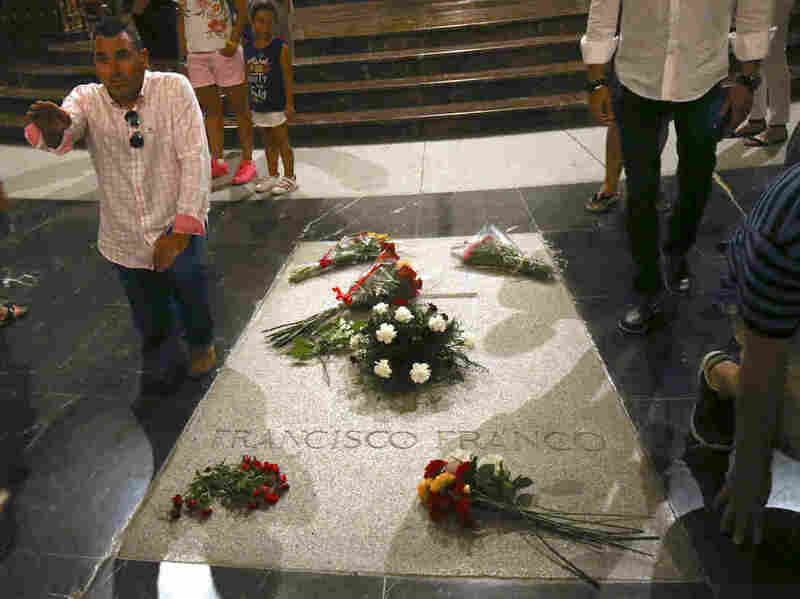 Last month, in a move that angered Franco's family and supporters, Spain's new Socialist-led government passed legislation allowing it to remove Franco's remains by the end of this year. Spanish Prime Minister Pedro Sánchez wants the Valley of the Fallen to become a memorial for the country's 1936-39 Civil War, rather than have it commemorate the dictatorship. "Spain can't allow symbols that divide Spaniards. Something that is unimaginable in Germany or Italy, countries that also suffered fascist dictatorships, should not be imaginable in our country," Sánchez said in his first televised interview after taking office in June. María Legaz, born shortly after the Spanish Civil War, chokes up and becomes emotional when she sees Franco's tomb. The Republican army that opposed Franco killed many of her family members, she says. A man does a fascist salute as he stands next to the tomb of Francisco Franco inside the basilica at the Valley of the Fallen monument outside Madrid. Spain's center-left government approved legal amendments that it says will ensure that Franco's remains can soon be dug up and removed. "We're in disagreement that this should even be touched," she says. "It's the only thing we have left of the 40 years that he was in power. There's history here, so why ruin it?" Queralt Solé, a history professor at the University of Barcelona, says that while the move is necessary to reconcile with the country's past, it's mainly a symbolic gesture. "The monument is the petrification of Francoism," says Solé. "You can touch it there. So even if they remove Franco, it doesn't take away the symbolism of the monument, which is very strong." 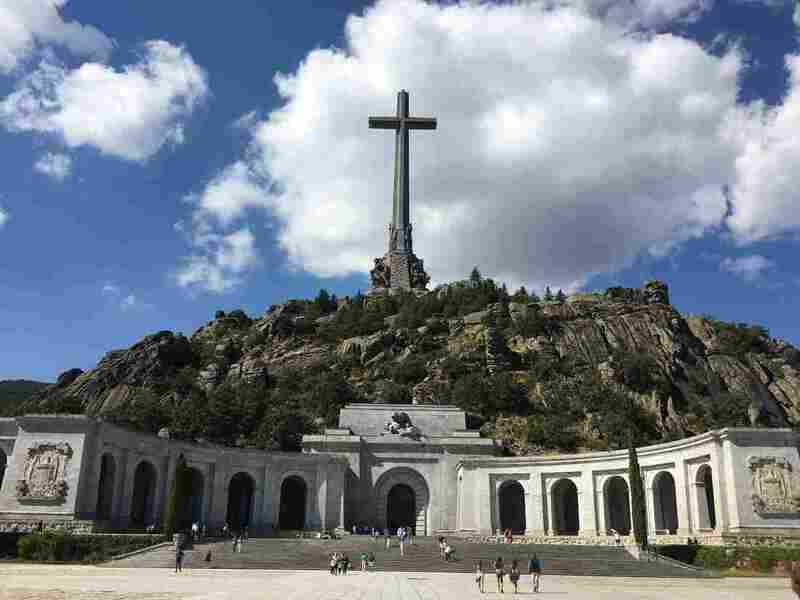 Alongside Franco's tomb, the Valley of the Fallen holds the remains of more than 33,000 people who fought on both sides of the Spanish Civil War. An inscription reads "Caídos por Dios y por España, 1936-1939, RIP" — died for God and for Spain. Yet some of the Republican soldiers who fought against Franco were buried here without their families' consent, and their descendants are still looking for their remains. 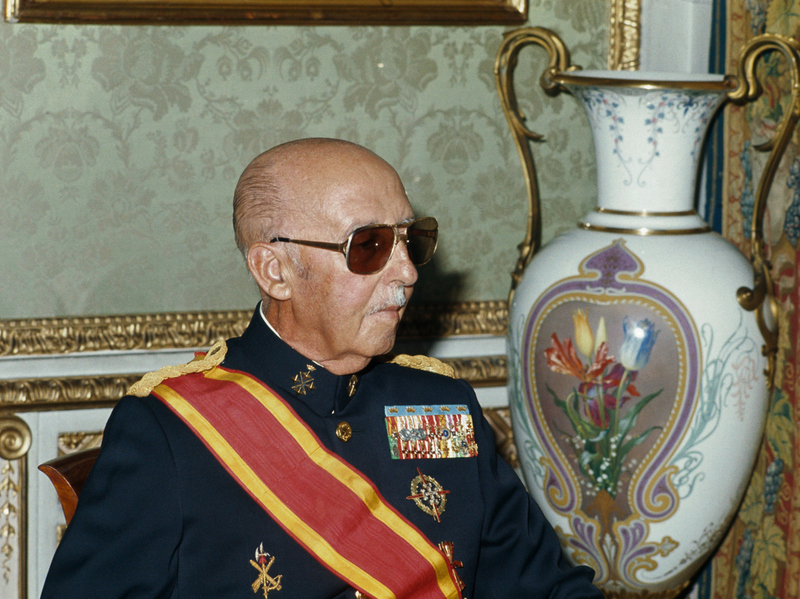 The dictator Gen. Francisco Franco, shown here in 1975, the year he died, ruled Spain for 36 years. From 1940 to 1959, the year the monument was inaugurated, Franco used political prisoners as slave laborers, forcing them to dig nearly a quarter-million tons of granite from a hill outside Madrid to construct the basilica. The stones were used to erect a 500-foot cross. Solé says the idea was to build a monument for the winners of the Civil War. Much like Franco's regime itself, the place represents a mixture of ideology and religion. "It's very serious that Franco's legacy is still very present, it's a much deeper and [more] difficult change than just removing plaques," says Solé. She adds that there's still a lot of work to do to educate families and schoolchildren about this part of history. Franco supporters have showed up in recent months to protest the removal of his remains, singing nationalist songs and raising their arms in the fascist salute. But many Spanish citizens applaud the government's move. Alejandro Rata Carrión, a recent visitor to the Valley of the Fallen, says there's an issue with the way Spaniards are taught about the Civil War and its resulting dictatorship. "It's something that has been covered up a lot," says Rata Carrión. "For example, I never studied recent Spanish history in school. It was always something that was left for the end of the course, and then we'd never get there." Spain's lack of reckoning with its own past is partly the result of an agreement negotiated in 1977, as the country made its transition to democracy. The so-called Pact of Forgetting established an informal understanding among Spain's political parties that the country would essentially forget what happened during and after the Civil War and move on. Around the same time, a broad amnesty law went into effect, providing amnesty to everyone who committed a political offense before 1977. This has made it extremely difficult to prosecute human rights abuses that took place under the dictatorship. Today, Franco's tomb has become a sort of pilgrimage site for his followers. Although a date for removal of his remains hasn't been set, it's likely to happen at night and in secret to avoid any possible pushback. Franco's relatives say they plan to move him to the Almudena cathedral in downtown Madrid, where they bought family rights to a crypt. They want him to be reburied with military honors. But doing so would undermine the Spanish government's original idea to do away with such a pilgrimage site. It would, in fact, make Franco's tomb more accessible.